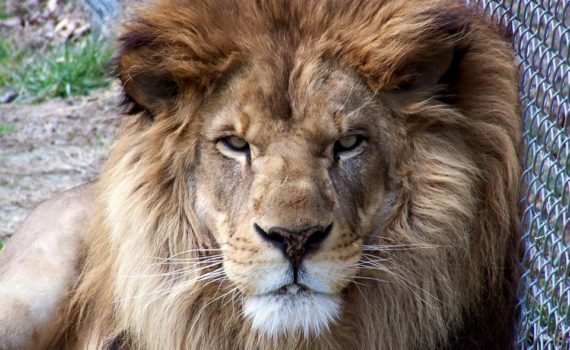 The Metro Richmond Zoo mourns the loss of Pawl, one of our male lions. He was nearly 21 years old. Pawl came to the Metro Richmond Zoo in 2000 and was a favorite among zoo staff and visitors. He truly was the king of the Zoo as his majestic roar could be heard from all corners of the park. He quickly became one of the famous faces of the Zoo. Pawl lived a wonderful, long life. In the wild, lions live 10-14 years. Often male lions don’t live past 10 years because they lose support from the pride when they are out of their prime years. At the Zoo, he was able to live 20 years under the care of his beloved staff. A few years ago, Pawl began suffering from arthritis. He was sedated for a full work up and has been medicated since. Over the last couple weeks, he was having a very difficult time getting up and down and going on exhibit. We increased his meds doses, but it did not help much. Pawl stopped eating and doing some of his favorite normal behaviors. On the morning of September 27th, Pawl was unable to get up, and it was time for us to make a very difficult decision. Our staff elected to humanely euthanize him. Pawl will always remain in the hearts of our zoo staff and guests. Pawl is survived by Basa and Xonga, our two white lions.